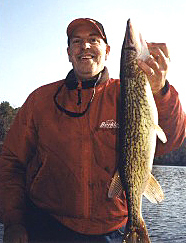 Fishing for chain pickerel and tiger muskie in Delaware. This state offers unique fishing opportunities. Listed below find information about these species of fish, found in some Delaware waters. Tiger muskie typically inhabit swallow areas of lakes and rivers, hanging around outside weed edges and under cover of submerged vegetation. During the summer, when water temperatures warm, large tiger muskies move to cooler and hold on structure. If natural springs are present they are inclined to stay near this cooler water. Northern pike hang around weedy areas and along the weed line in lakes. Pike move into deeper water during the warm summer months. Tributary streams can be very productive in spring, before, during and after the spawn. Larger lakes across the state of Delaware, with pike populations, include Andrews Lake, Concord Pond, Coursey Pond, Horsey Pond, Ingrams Pond, Lake Como, McGinnis Pond, Millsboro Pond, Records Pond, Wagamons Pond, Brandywine River, the Delaware River and others. Many of the species we portray as "other" in this website are simply not as commonly fished for as the more popular fish. For insight into some of these "other" fish in Delaware, visit the other fishing page for more in-depth information. Best fishing lakes in Delaware!